The world's first chocolate kimono is due to be unveiled by a US chocolatier at its new outlet in Japan later this month. 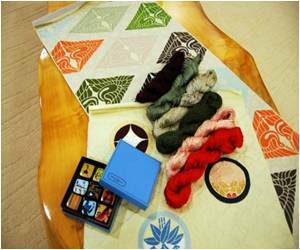 About a third of the dye for the silk kimono, a traditional flowing outfit that is now mostly worn on special occasions, is from chocolate made by New York's MarieBelle for its cafe in the country's ancient capital Kyoto. The dye, including creamy white chocolate, is being used to colour a pattern showing Japan's beloved cherry blossoms in brown and blue set against a light beige background for the store, MarieBelle's first in Japan. "A sweet chocolate scent filled the air in the process of dying," the wife of kimono designer Nobuaki Tomita told AFP on Thursday, adding that the final product would no longer smell like confectionery. Tomita has previously dyed traditional Japanese fabric with edible items, including green tea and apples, she said.